Now in stock at Specialist Cars Of Malton is this delightful and luxurious Rolls Royce Corniche III convertible from 1990. The car is beautiful condition and is stunning, a comprehensive history is present and this is very rare opportunity to own one of the most stunning cars on the road. 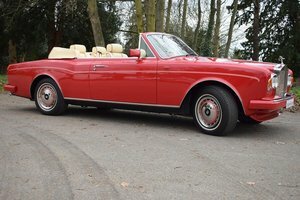 The Rolls-Royce Corniche is a two-door, front-engine, rear wheel drive five-seater produced by Rolls-Royce Motors as a coupé and convertible from 1971 to 1995. The Corniche was a development of the Rolls-Royce Silver Shadow, with the two door variants of that model marketed as the “Silver Shadow Mulliner Park Ward two door fixed head coupé & drop head coupé” until March 1966, when the Corniche name was applied. The exterior design was by John Polwhele Blatchley. The model was assembled and finished in London at Mulliner Park Ward as continuation of the 1965 Silver Shadow coupe and 1966 drophead. A Bentley version was also sold, becoming known as the Continental in 1984. The first car with the Corniche nameplate was a 1939 prototype based on the Bentley Mark V and never produced because of the onset of World War II. The Corniche nameplate stems from the originally French and Italian term for a coastal road, especially along the face of a cliff. Specialist Cars of Malton are proud to present the Rolls Royce Corniche III. 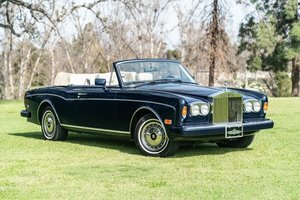 The Series III Corniche Convertible was introduced in 1989 with improvements that included New Alloy Wheels, Color-Coded Bumpers, Suspension Upgrades, Air Bags & a New Fuel Injection System. Interior changes comprised of a revised Dashboard, Console & Seats. This outstanding low mileage example, believed to have covered 17,837 miles was originally supplied new by HR Owen finished in Midnight Blue with Magnolia Leather & contrasting Blue Piping and Dark Blue Carpets & a Dark Blue Mohair Hood. Factory features and options include Drinks Compartment to Passenger Door, Storage Drivers Side, Veneered Door Panels, Badge Bar, Provision for Radio/Telephone Including Aerial & Non Standard Paint. What Comes With The Car? As always it will with our full sales package of 12 months tax, mot and warranty, car cover, optimate, major service, full of fuel and delivery worldwide.